Geoff Beakley was born in Princeton, New Jersey but his family soon moved to Atlanta, Georgia where he attended Henderson High School in Dekalb County and developed an aptitude for math and science. He attended Georgia Tech where he earned a bachelor’s degree in Mechanical Engineering in 1994. Acknowledging a call to ministry after a 21-year career in technical sales, Geoff went on to complete a Master of Divinity at Candler School of Theology in 2018. He currently is working under a dual appointment with The United Methodist Church as an associate minister at Peachtree Road United Methodist Church and the Director of the Wesley Foundation at Georgia Tech. Geoff and his wife Leigh enjoy spending time with their two Labradoodles, Noah and Fin. 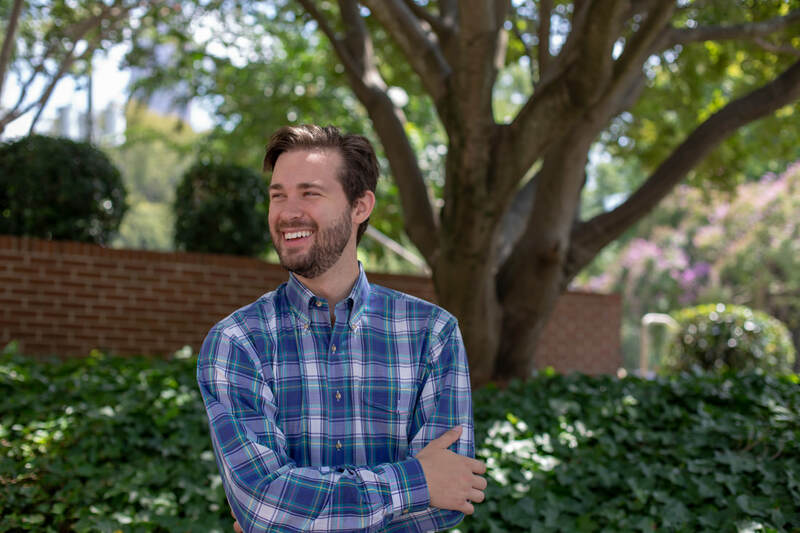 His deep love for God and neighbor fuels his passion for higher education ministry and he’s extremely excited and grateful to serve the students of his alma mater of Georgia Tech. Carlene Fogle-Miller graduated from the International Baccalaureate program at Bartow High School, Florida Southern College (B.A. Political Science), and the University of Mississippi School of Law (Juris Doctorate). She is currently in her first year of pursuing a Master of Divinity from the Candler School of Theology at Emory University. Before coming to Atlanta, she worked at Gulf Coast Wesley Foundation in Fort Myers, Florida. She is a proud alumna of Alpha Chi Omega, and volunteers remotely as an advisor for the chapter at Florida Gulf Coast University. In her free time, she enjoys reading, Broadway musicals, spending time at the beach/lake/any body of water, hiking, and spending time with her cat, Gopher. Jeremy Green is an Atlanta native who attended Forest Park High School and graduated in 2010. Belonging to a family where music and ministry were held close to heart, he attended Bethune-Cookman University where he received a marching band scholarship and majored in Religion and Philosophy. A life long acknowledgement of a call to ministry lead him to pursue a Master of Divinity at Emory University’s Candler School of Theology. In moments of relaxation Jeremy can be found searching for new music, reading and writing poetry, or enjoying time with family.